Report by Jane Champion who led the ride. 15 riders set off from Burgess Park and within seconds of departure the leader’s chain slipped during a dodgy gear change on the upward slope of the Wells Way underpass. Assistance gratefully received from Malcolm – wet wipes provided for clean-up in recompense. To Myatts Fields via quiet streets and onwards to Clapham North with a brief spell on Clapham High Street (CS7) before turning right into residential roads leading to Clapham Old Town and access to the Common where a Cancer Research UK ‘Race For Life’ event was underway - participants easy to spot in various shades of pink. After a 10 minute break at The Bandstand Café we headed back to Old Town, much improved by Lambeth Council sponsored regeneration with improved traffic flows around an ‘urban piazza’, more trees and greenery, outdoor seating and suchlike. Overall, traffic was mostly light and slow-moving with drivers accommodating all our right turns (especially bus drivers). Peckham to South Bank Loop. 14 riders set off from Peckham Square heading for the South Bank in good cycling weather, not too hot, not too cold, not too windy, and dry. Across Burgess Park and down to the eastern bypass of the Elephant. Then Trinity Square, Great Suffolk Street and Southwark Undergound Station. Here The Cut was closed to motor traffic, but a neat cycle route has been left through the road works. The Cut itself was not as free of traffic as I had expected as there are a lot of side turnings. Noted a long queue on Webber St at its junction with The Cut, so clearly Saturday morning traffic having some problems. Down Cornwall Rd to the Thames. Short stop, then back along National route 4 following the river. Borough Market already very busy. At Dockhead (end of Tooley St) headed inland via Bermondsey Spa Gardens and joined LCN22 at Lynton Rd. Work on Quietway 1 is finished in Lynton Rd and has transferred to Willow Walk which is closed to traffic (no bike path, but pedestrian access). Continued along LCN22 back to Peckham Square. Route at https://goo.gl/zI7Glx. "Plus" ride led by Werner with 13 riders. We headed for Kings Cross to look at the new stuff there. Route through relatively quiet City. Stopped for a while in Granary Square at the mobile coffee shop in a converted old Citroen van that Malcolm claimed was a genuine antique. One rider knew about the open air swimming pond, so we headed in search. Not properly open, but looks interesting - it is an "Art Project"! David leading on the Canada Water, Greenwich, Isle of Dogs, Wapping, Tower Bridge loop. Weather good but little windy. 12 on ride mostly familiar faces with Nigel acting as very good back marker. Parks, Cemeteries and a Museum. 13 riders set off from Peckham Square heading for the Horniman Museum in cool weather following earlier rain. Up to our first cemetery, Nunhead, and then on to Camberwell Old Cemetery via the top end of Peckham Rye Park. Next the short steep climb of Langton Rise and along Westwood Park to Horniman Gardens. Did not use the cycle path on the west side of Horniman Gardens as the surface is really bad and it is being dug up at intervals making the path narrow and a dangerous. A shame that this useful off-road path on the London Cycle Network has been allowed to get into such a poor state. At Horniman Gardens a small Farmer’s Market attracted the attention of riders, so a rather longer break than intended ensued. Set off back along Westwood Park then continued up Brenchley Gardens to Camberwell New Cemetery. Quiet paths across the cemetery led to the exit by the crematorium on Brockley Way. Next stop was our fourth and final cemetery, Brockley and Ladywell. Frustrating that the entrances along Brockley Grove are all padlocked so can only pop in and out of the main entrance. It would be possible open up a ready made cycle path parallel to busy Brockley Grove by unlockng the first gate after Merritt Rd. From this point headed pretty much straight back to Peckham via Ivy Rd, the path over the railway at Dalrymple Rd and Nunhead station. Back a few minutes late but that was due to there clearly being much more uphill than downhill (or at least that is how it felt!). So we missed a couple of parks, but did all the cemeteries and a museum. A good morning’s ride. Route at http://goo.gl/XzFkTD. 14 riders at Burgess Park for a "+" ride. 9.30 start with the Café doing a good trade in pre-ride refreshments. Headed towards Lambeth Bridge using the west bypass of the Elephant. Found the alternative path at Churchyard Row, which goes through the churchyard itself, rather nicer than the previous slightly enclosed route. From Lambeth Bridge through to Horse Guards, then along the Mall and up Constitution Hill to Hyde Park Corner. Work on the north side of the crossing of Knightsbridge forces pedestrians and cyclists into even closer contact than before. This work is part of the new E-W Cycle Superhighway. As has occurred in some other places, little consideration appears to have been given to pedestrian and cycle routes at road works. Here it would be easy to open up the centre arch of the Hyde Park Corner Screen to give everyone more space. Across Hyde Park along the cycle path next to Rotten Row with the Serpentine shimmering in the spring sunshine. 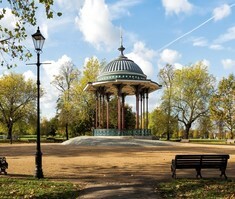 Then across Kensington Gardens to the café beside the Lady Di Playground. In very good time so a lengthy coffee and loo break ensued. Returned across Kensington Gardens then headed south along Exhibition Rd, past South Kensington Tube station and down to the Albert Bridge. Leisurely circuit of Battersea Park followed by exit onto Battersea Park Rd. This was to avoid the roundabout at Queens Circus which is very difficult for a group of cyclists as traffic flows are continuous, even on a Saturday. Route back included Larkhall Park and Lansdowne Gardens (the circus looking really beautiful with the blossom in the sunshine). Made good time so stopped to watch the BMX-ers in Burgess Park – lots of riders some doing BIG jumps. Back at Burgess Park Café at around 12.40. A remarkably relaxing ride with London’s Parks looking splendid – freshly green leaves against a blue sky.